In Bruce Arians' first season as coach, the Cardinals (9-5) have already won four more games than they did all of last season. 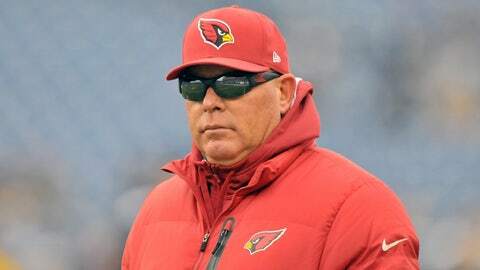 TEMPE, Ariz. — Bruce Arians is the first Cardinals coach to post a winning season in his first year on the job since Charlie Winner in 1966. Eleven coaches after Winner tried; eleven coaches after Winner failed. Even if the Cardinals win their next two games, they might not make the playoffs with an 11-5 record — and 10-6 almost assuredly won’t be good enough in the NFC — but after a 5-11 debacle in 2012 that included a 58-0 loss at Seattle (this week’s road opponent), can there be any doubt the Cardinals have made significant strides? Despite a nearly complete makeover of the coaching staff and a turnover of more than 50 percent of last year’s roster, the Cardinals (+4) join the Chiefs (+9) and Eagles (+4) as the only three teams in the NFL this season that have already surpassed their 2012 win total by at least four games. Sunday’s game in Tennessee wasn’t perfect — far from it. The Cards blew a 17-point fourth-quarter lead, the NFL’s fifth-raked defense was mostly a rumor and the Cardinals were uncharacteristically sloppy in the penalty department, whether you agreed with some of the officials’ calls or not. But they got it done. Again. It was Arizona’s sixth win in its last seven games. You want your team to be peaking at the end of the season, and that’s what the Cardinals appear to be doing. Sure, it would have been nice to grab that game in Philadelphia, or grab earlier road games in St. Louis and San Francisco, but those were part of the learning curve. Remember, this is season No. 1 for Arians and his staff. It’s season No. 1 for GM Steve Keim. It’s season No. 1 with the Cardinals for more than half of the players on the roster. A winning season in the NFL’s best division? Who would have dreamed it? Now for a look back that Music City milestone win, which secured Arizona just its fourth winning season since arriving in the Valley in 1988. Antoine Cason’s interception in overtime: The Cardinals had already squandered a 17-point lead late in the fourth quarter, and the Titans had the ball first in OT and were driving at the Arizona 43-yard line when QB Ryan Fitzpatrick was hit by safety Tony Jefferson as he threw. The ball floated right into Cason’s hands, and he returned it to the Cardinals’ 46-yard line. Seven plays later, Jay Feely connected on the game-winning 41-yard field goal. RB Andre Ellington: Before he left the game with a thigh bruise, Ellington touched the ball 14 times and gained 158 yards (10 carries for 71 yards, four receptions for 87 yards). Seven of Ellington’s touches went for more than 10 yards and three went for 20-plus. How exactly did he fall to the sixth round of the 2013 draft? CB Antoine Cason: In his first significant playing time this season, the University of Arizona product had two interceptions. One was a pick-six, the other set up the game-winning field goal. With Tyrann Mathieu out, the Cardinals needed plays from a committee of replacements. The defense didn’t play well in Nashville, but Cason came through. Cason also recovered Feely’s “mortar” pooch kickoff to start the second half. Carson Palmer is plenty tough: Last week, he played through a sore elbow and completed 27 of 32 passes for 269 yards and a TD with no interceptions. On Sunday, he played through a sprained ankle suffered after Kamerion Wimbley hit him low yet completed 20 of 30 passes for 231 yards and TD with no picks for the fourth time in his last five games. The Cardinals will probably be cautious with him in practice again, but Palmer will play against the Seahawks and their fierce pass rush on Sunday. It will take some time to replace Tyrann Mathieu: Not all of the Cardinals’ secondary problems can be attributed to Mathieu’s loss. Other than Darnell Dockett in the first half, the Cardinals didn’t sustain a steady pass rush against Fitzpatrick, who threw for 402 yards and four TDs. John Abraham and Calais Campbell were mostly neutralized. But cornerback Patrick Peterson, who had a dreadful day, admitted there were mix-ups in the secondary that are the product of new personnel in new roles. The Cards had better hope one week of practice is enough to sort that out, because the Seahawks and 49ers will pose a much greater passing threat than the Titans did. The Cardinals are getting no help in the their playoff chase: Carolina and San Francisco both won again on Sunday, and the 49ers are one win or one Cardinals loss away from not having to worry about Arizona catching them. The Panthers have a big game with the Saints in Charlotte this week that could decide the division title. The next week, they play at Atlanta. Catching the Panthers is probably the Cards’ best chance at the playoffs since they win a two-way tiebreaker via their head-to-head win. Palmer suffered a low grade left ankle sprain but finished the game with it taped. Ellington suffered a bruised thigh and left the game, but Arians said he believes both will be fine to play in Seattle. 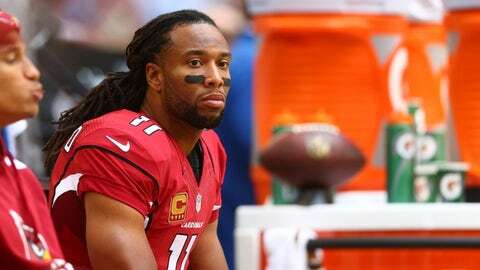 Receiver Larry Fitzgerald suffered a concussion and will be subject to the NFL’s concussion protocols this week. He passed preliminary tests to leave the stadium on Sunday but must pass more. Tight end Rob Housler missed the game with a groin injury and is still day-to-day. Free safety Rashad Johnson suffered a high ankle sprain, and that is a concern with Mathieu already out for the season. If Johnson can’t play, Jefferson will start and Curtis Taylor will back him up. Bryan McCann and Javier Arenas would also have roles in the secondary. — Fitzgerald suffered his concussion when he was hit trying to recover the final onside kick. It looked like a penalty should have been called for helmet-to-helmet contact on Jackie Battle. That hit will likely result in a fine, but it could be far more costly for the Cardinals if Fitzgerald misses time. Arians likes onside kicks and doesn’t want to see them removed from the game, but he does think the competition committee will look at what constitutes a defenseless player on onside kicks. — The Cardinals had no penalties in the first half. They had four on the Titans’ 16-play touchdown drive to begin the second half, two of which negated third-down stops. There was plenty to complain about with the officials on Sunday, but the Cards put themselves in position to be called for those penalties and need to get that cleaned up. — The last player to lead the Cardinals in rushing and receiving, as Ellington did Sunday, was running back Marcel Shipp in December 2002, when he had 79 yards rushing and 79 yards receiving in St. Louis. — The Cardinals have scored eight TDs in the last two games. Seven of them were scored by a player not on the roster last season. — Arizona posted an 8-2 record against teams outside its division this season, establishing a new franchise record for wins outside the division since realignment in 2002. — After holding the Titans to 66 rushing yards on 19 attempts, the Cardinals have the NFL’s top-ranked run defense, allowing just 83.2 yards per game. — The Cards have won nine of their last 11 overtime games. — Receiver Michael Floyd’s streak of 24 consecutive receptions for a first down represents the longest active one in the NFL — by a wide margin. The longest streak after Floyd’s is 10 straight. At Seattle, Sunday, 2:05 p.m.: The Seahawks can lock up home-field advantage throughout the NFC playoffs with a win, so they will be motivated. They own the NFL’s best record (12-2) and they have not lost a game at home the past two seasons. The Cardinals have their work cut out for them. Larry Fitzgerald’s status for Sunday’s game in Seattle won’t be determined until he completes mandated baseline tests under the NFL’s concussion protocol. 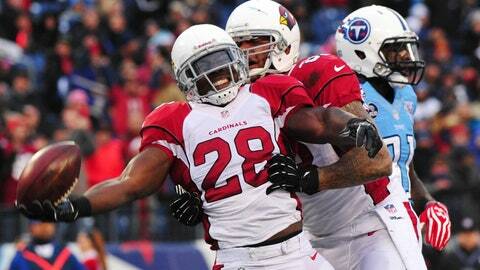 Rashard Mendenhall scored two TDs and the Cardinals outlasted the Titans in overtime.